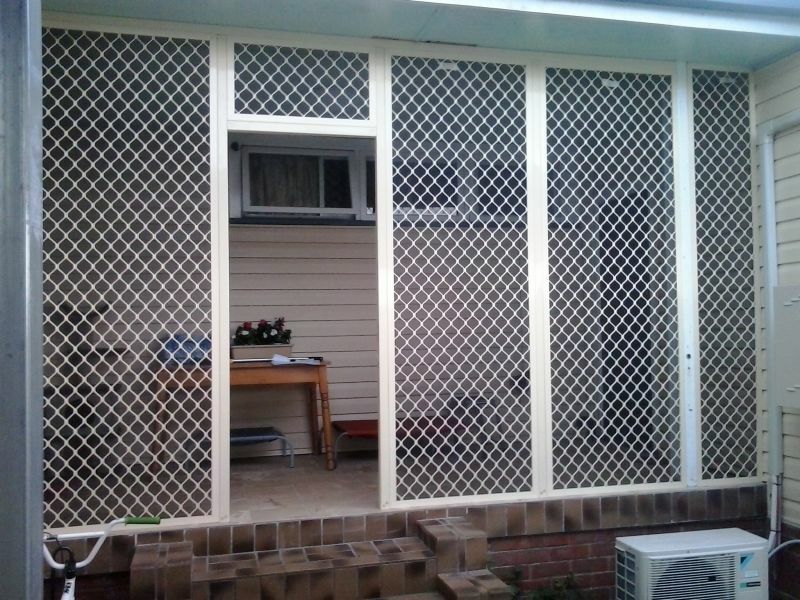 Diamond pattern doors and grills offer superior protection from burglars attempting to invade your property. 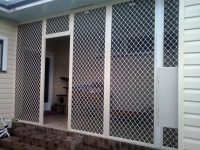 This type of security grill is the most economical security option for your home. They limit the likelihood of your home being invaded and your personal property stolen by providing a strong barrier to unwanted entry. As a bonus they also keep out those pesky insects, including the biting varieties. Giving you the peace of mind that you and your property are safe whilst allowing you to have a cool and natural ventilation system which is environmentally friendly. Diamond pattern doors and grills can be retrofitted to almost any door or window or be used as a stand alone screening option. This includes large multi-door size openings. These grills are available in several different styles all of which resembling a diamond pattern. 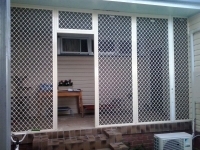 They are 7mm thick and are made from extruded aluminium which has been stretched to form that familiar diamond pattern which distinguishes them from other security grills. Like the grills the frames are also made from extruded aluminium and use of the same metal in both frame and grill, as well as the fact that it’s aluminium, means that these grills have a high corrosion resistance. There are a lot of optional extras available when considering exactly which diamond grill or door you would like. 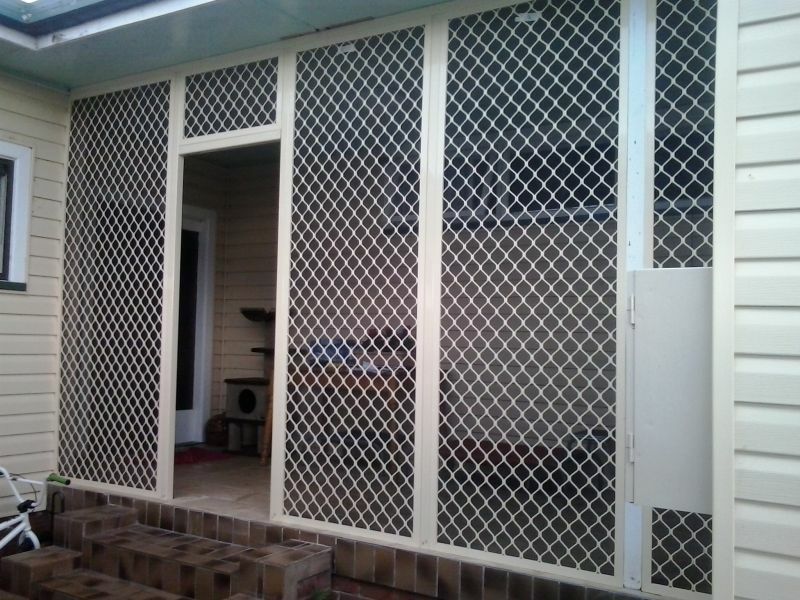 These include different types of fixing systems for grills and locking mechanisms for doors as well as different mesh choices. These doors come in standard colours and non-standard colours. The extras chosen will be specific to your home and window type. 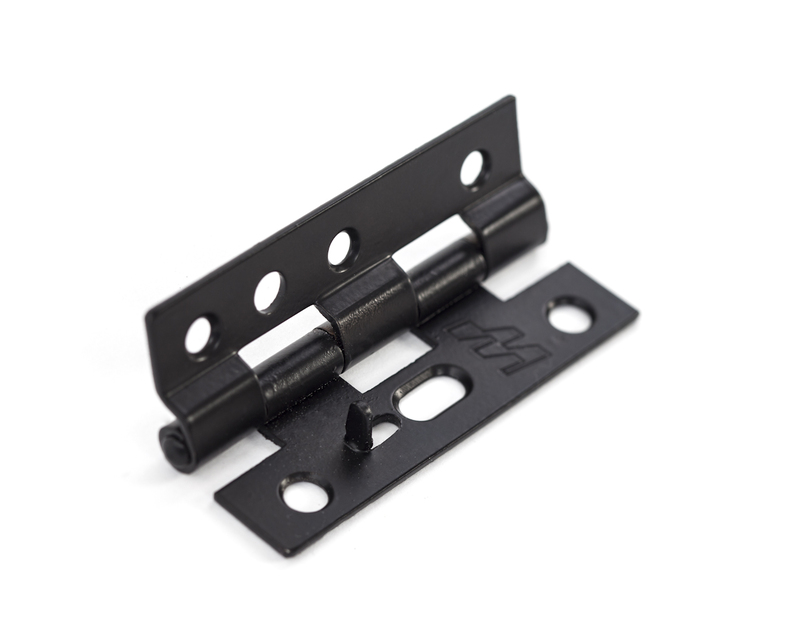 These doors come standard with a single point lock, however we highly recommend a three point lock, which has a lock top and bottom as well as the central lock. These are all operated from the central lock, so that there is no extra inconvenience. Optional: Opening by sliding or hinged for fire safety quick escape. More information about fire options. What do we do when there are French (two hinged or sliding doors that lock into each-other) or stacking (multiple sliding doors sliding on one direction) doorways? When these doorways are screened we use our internal flush-bolts to secure each individual door, except the main use panel which is secured using the normal hinged or sliding door lock. One way or lookout mesh – Aluminium sheet that is punched, stretched and angled which limits view and allows greater privacy in one direction. Standard: black, white, primrose, stone beige, bronze, clear anodised, white birch and occasionally some other colours depending on our suppliers. Non standard: any colour which is available through our local powder-coater or by special request from our supplier. These may cost extra and will take longer to be delivered. Note: Doors and grills can be coloured with the frame and grill differently. This is commonly done to make houses match when there are different colour schemes in different rooms. Commonly a black grill will be used as this is the easiest colour to look through because it reflects less light to your eye and blends into the black fly-screen mesh. Note: If you have a particular colour in mind and you know the name of it please Contact Us and we will let you know if it is a colour we can do for you and if so, if it is standard or non-standard.